6 speed overdrive transmission that is in near perfect condition with only minor cosmetic imperfections. The V65 Magna has a new front tire and the rear tire has a few thousand miles left on it. There are no rips or tears in the seat; it's in perfect condition. All of the motorcycle's electronics work. There is a fork mounted handlebar windshield included with the sale. It has currently has the OEM rear grab rail installed but comes with the Honda OEM sissy bar and “6 Pac Rack”, the OEM Factory maintenance manual, valve adjustment tools and some spare parts. I bought the Honda motorcycle for sale in March last year with 21,700 miles. Shortly after I bought it I changed the engine oil and filter, rear drive oil, fork oil and break and clutch fluid and changed the engine oil and filter again at 24,500 miles. I recently completed a valve adjustment and the carbs were professionally overhauled earlier this year. They were completely dissembled, cleaned, polished, re-assembled with stainless steel hardware and bench synched. 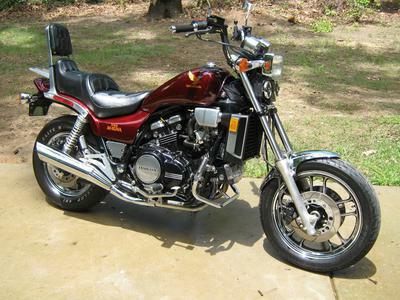 The 1984 Honda Magna V65 for Sale is located in Greensboro NC NORTH Carolina and my price is $3500. The Magna is 30 years old but it looks, sounds and runs like it's new! Before you leave GoGoCycles Used Honda Motorcycle Classifieds you might want to take a look at this 1984 Honda Magna 700, this 1984 Honda V30 Magna 500, this 1984 Honda Magna 500 or one of the other nice bikes we have listed here on GoGoCycles Motorcycle Classifieds. What did it sell for if I may ask? I have the same and curious what I'd get?